ABSignal specializes in providing low-cost, multi-scale and high-performance systems and software for sound & vibration testing and structural dynamics analysis. Products of ABSignal are intended to be ease of use tools for engineers to help them analyzing and solving sound & vibration problems at any time. ModalVIEW is designed for you to easily acquire multi-channel sound or vibration signals from a running machine, or the static or dynamic loading of a structure by utilizing data acquisition hardware. After obtaining a set of time histories, it can animate the response of a structure and show you the structure's vibration behavior at once. It helps you to extract and visualize useful modal parameters information from acquired time- and frequency-domain experimental data. ModalVIEW software is developed under National Instruments' LabVIEW, an open environment designed to make interfacing with any measurement hardware rapidly and simple. ModalVIEW software is compatible with any dynamic signal acquisition (DSA) hardware of National Instruments including plug-in boards, USB devices, and PXI systems and speed your time to perform experimental measurement. With ModalVIEW software, a low-cost modal testing and analysis tool, you can also leverage your structural testing capabilities by utilizing existing investment in NI DSA hardware. Please try modal analysis and testing in NI LabVIEW platform! 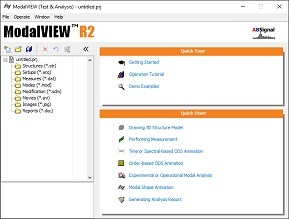 ModalVIEW R2 is upgraded to LabVIEW 2017 platform, and supports the latest NI DSA hardware. ModalVIEW software is certified by National Instruments Corp for the Compatible with LabVIEW Gold level. Cooperated with National Instruments, ABSignal expects to provide reliable, high-quality products and services for our common customers. ABSignal performs a modal testing experiment of Engine Crankshaft Structure for a university laboratory. ModalVIEW software is certified by National Instruments Corp for the Compatible with LabVIEW Silver level. Thanks to the thorough test by NI engineers and good reviews from customers, we are dedicated to offering quality support to our customers and to constantly improve our software according to customer needs. ModalVIEW expands NI DSA hardware supports to NI compactRIO platform, which is suitable for remote and distributed modal testing applications. 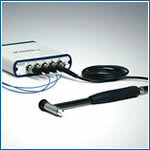 National Instruments announced a new portable bus-powered dynamic signal acquisition (DSA) module and sensor suite. With the new NI USB DSA module and sensor suite, ModalVIEW gives engineers a complete impact hammer modal testing and analysis solution. Copyright 2018 ABSignal, Inc. All rights reserved.